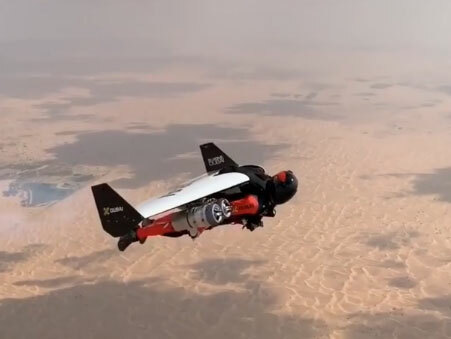 Dubai: Flying through the city with a jetpack may not be limited to just cartoons and movies, as Dubai’s very own Jetman was once again caught travelling over the UAE desert. Shaikh Hamdan Bin Mohammad Bin Rashid Al Maktoum, Crown Prince of Dubai and Chairman of Dubai Executive Council, posted a video of Jetman Dubai pilots Vince Reffet and Fred Fugen as they flew through the skies and under the clouds as they performed various stunts. The video was accompanied with the caption, “The future is here”, and was also written in Arabic. The online video went viral across social networking sites since it was posted nearly 24 hours ago, receiving more than 763,000 views so far. Driven by his desire to “fly like a bird,” Swiss military-trained pilot and aviation enthusiast, Yves Rossy, designed and built what is today known as the Jet-wing. The Jetman Dubai and XDubai partnership first made global headlines in 2015 with the world’s first twin Jetman formation of Rossy and Reffet over the skies of Dubai; an accomplishment which was then followed by another jaw-dropping feat that saw Rossy and Reffet fly alongside an Emirates Airline A380 later that same year.